Purslane, (Portulaca oleracea) is a member of the Portulacaceae family with more than 120 different species worldwide. The use of this incredible plant as a vegetable, spice and medicine dates back to ancient Egypt. During the Middle Ages it was very popular throughout many countries and especially in Great Britain. Purslane is an annual reproducing from seeds. Seeds of purslane have been known to stay viable for over 40 years in the soil. In fact, one purslane plant can drop over 200,000 seeds – yes, just one plant. This plant does have a close look-a-like that is toxic called the hairy-stemmed spurge. Often these two grow intertwining with one another so it is really important to be very careful. Click here to learn about hairy-stemmed spurge. Up until recently (in Canada and the U.S.) the only research on purslane was on how to eradicate it; yet in other areas of the world it has been enjoyed for hundreds of years. Purslane is native to India, Turkey and Persia and has spread throughout the world as a favourite edible wild (and cultivated) plant. In fact, the first records show that purslane was used as medicine and food in Persia and East India more than 2,000 years ago. Many cultures embrace purslane as a food. Purslane was first reported in Canada in 1863 and in Massachusetts in 1672. Purslane contains two types of betalain alkaloid pigments – the yellow betaxanthins (visible in the flowers) and the reddish betacyanins (noticeable in the colour of the plant’s stem). The reddish betacyanins as well as the yellow betaxanthins are both powerful antioxidants and laboratory researchers have established that they possess anti-mutagenic properties. There is no shortage of vitamins A, C and E in purslane, all of which are known for their antioxidant powers. So between these vitamins and the betalain alkaloid pigments purslane is packed with antioxidants. It is also worth mentioning that purslane also contains co-enzyme Q10 which is a powerful antioxidant that almost every cell in our body must have this to stay healthy. This antioxidant converts food into energy. Although our body produces coenzyme Q10, we need to add to this through our food choices to get the amount we require. Glutathione is a powerful antioxidant and an immune system booster. In fact glutathione is known as a ‘master’ detoxifier and a ‘maestro’ of the immune system. Our body produces glutathione however poor diet, pollution, toxins, stress, trauma, medications, aging, radiation and infections can deplete glutathione levels. Purslane contains significant levels of glutathione. Purslane contains protein, fat, and carbohydrates. It also contains 40.4 grams of water so it is beneficial to eat on a hot day to help hydrate. Purslane is considered to be an excellent source of Omega-3. Dr. James Duke, (an herbalist and botanist who passed away in 2017), found that purslane contains up to 4000 ppm of omega-3 fatty-acid alpha linolenic acid (ALA); this means a 100 gram serving contains 400 mg of ALA. Chickens fed a diet of purslane lay eggs that have twenty times more omega-3’s than regular eggs. James Duke suggests adding walnut oil to your purslane to increase the effect. There is a lot of vitamin A in purslane, 568 IUs worth. This is 11 percent of an adult’s recommended daily intake. Purslane has 21 mg of vitamin C per 100 grams. It also contains vitamins E, B1, B2, B3, B5, B6, folate (B9), and 5.5 mg of choline. Although not considered to be a nutrient, there is no shortage of amino acids in purslane and these are the necessary building blocks to protein. A partial list of the amino acids that purslane contains are the following: cystine, isoleucine, lysine, methionine, phenylalanine, proline, threonine, tyrosine, and tryptophan. There are many ways to add purslane into our diet but perhaps one of the tastiest ways of doing this is by making a purslane smoothie. The smoothie can be enjoyed anytime and it freezes well for long-term storage. 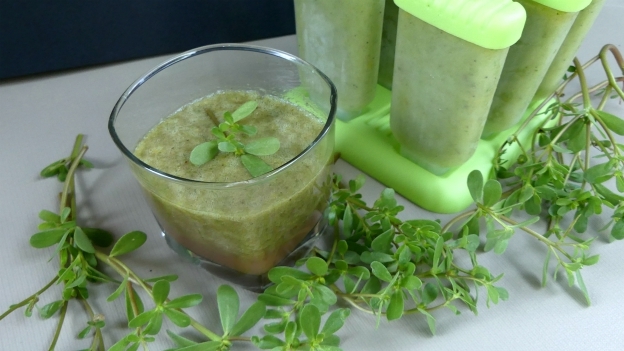 Alternatively, you can make a large amount of purslane smoothie and make popsicles or freezies with them to enjoy on a hot day. Making a smoothie is simple and the recipe can be found by clicking here! So whether you find any purslane on your foraging trips, in your garden, or if you cultivate this incredible plant, it is great to know that this plant offers our health a wealth of nutrients. To purchase a digital magazine that has a wealth of information of the purslane plant please click here! For identification information and some links to purslane recipes please click here. Can I buy this in a pill form? You would have to do a search as I do not know. Exciting article. I’m in Ontario and would like to know where I can purchase purslane in the Toronto/GTA area? I think I see it on the ground in my neighborhood but I would never use something that has been exposed to birds, pets etc and all they eliminate…lol. Please respond to my email below. Thanks so much. I am in the GTA and I am not aware of anywhere that sells this plant. Richters sells the seeds I believe if you want to grow some next year! Karen–I have a few questions if you don’t mind. So, because of the reddish betacyanins and the yellow betaxanthins, you are also eating the stems and flowers, yes? We’ve only been munching on the leaves and stopped eating the plant right before flowering assuming that it was less nutritious afterward. To get the benefits from purslane over a longer period are there other ways you’ve preserved it other than smoothies? I’ve dried some, but can’t know if the nutrients are there without a laboratory, ya know? Also, it adds improved moisture, texture and flavor to pesto. I substitute some of the basil, up to half, with purslane and freeze several batches each year. Will try your smoothie recipe. Love our purslane here in Missouri! The betacyanins possess antioxidant properties beneficial in the prevention of cancer and cardiovascular diseases – especially the red betacyanins! Typically most plants retain their constituents in the drying process although with purslane being a succulent I would think it loses some goodness too. Regardless – still healthy!! Sounds wonderful Jan! I hear purslane is also used in skin care products in Turkey as well! OMG thanks!!! This is great!